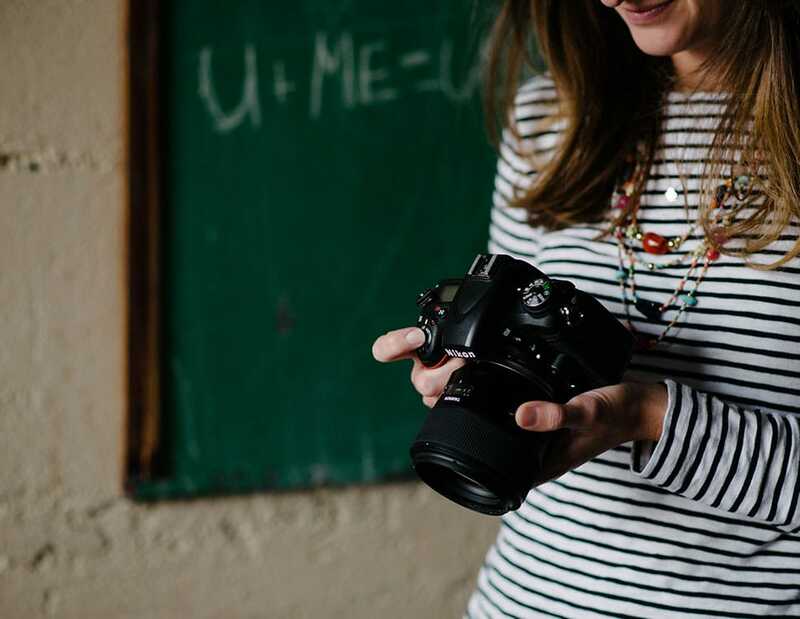 As you look at cooking blogs/websites or cookbooks, pay attention to what style of food photography you like and what it is that draws you in. I have always been drawn to the photography in Martha Stewart’s Everyday Food magazine http://www.marthastewart.com/everyday-food as well as the Donna Hay magazine or website http://www.donnahay.com.au/ . The photography in both of these magazines reflects a clean, simple approach with great lighting and not a lot of props or distractions. Decide what style you like best and go with it! 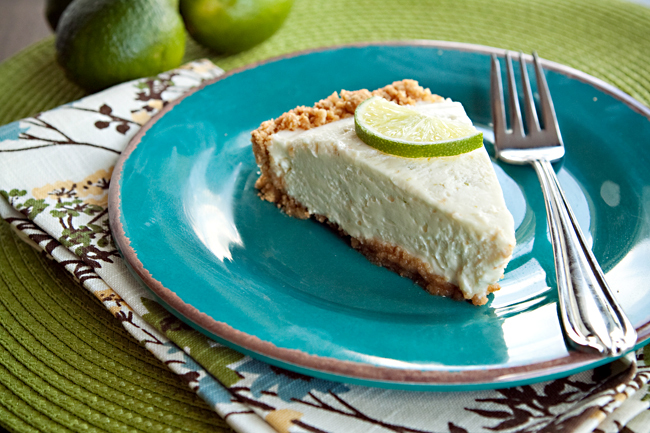 Another fabulous website worth turning to for inspiration is Foodgawker.com. Styling (backgrounds, props, and surfaces) is a key consideration to make before you begin shooting. However, keep in mind that the focus should mainly stay on the food. The main purpose of props is to artfully take up space in the composition while at the same time, adding to the feel and ambiance of the photo. So they should be used selectively, when needed to fill up negative space or to create a mood. Styling questions you might ask yourself to get your creative juices flowing: What colors will best compliment the food and/or go together? What look or feel are you trying to achieve? For example, romantic, fresh out of the oven, comforts of home, holiday traditions, kid favorite, bright and fresh. Is this food generally made during a specific season? If so, what props or colors will best portray that season? 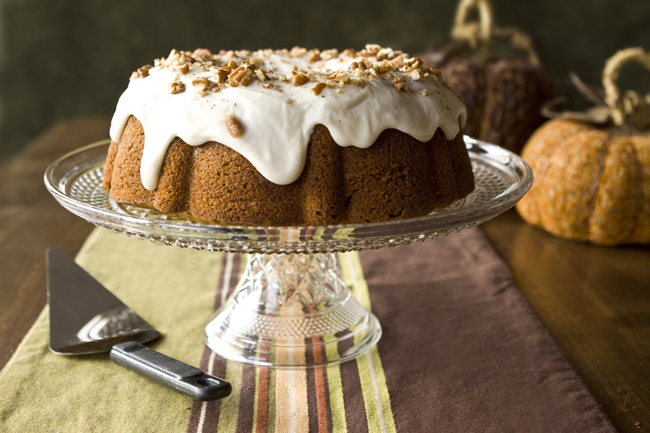 Here’s a photo I took in the Fall of a pumpkin spice cake. Styling is my favorite part about shooting food because there are endless creative possibilities! Think about napkins, dishes, glassware, silverware, table cloths, reflective surfaces, color schemes, etc. that you might want to include in your shot. Be creative with what you have around the house, or keep an eye out at places like Target, IKEA, or the fabric store for fun fabrics (usually about 1 ½ yards is all you will need), napkins, or plates that might photograph well with food. –Avoid mixing too many patterns so as to not detract from the food. For example, if you use a patterned napkin or table cloth, make sure your background and/or dishes are a solid color. When it comes time to select a plate, choose a plate that is on the “plain” side and on the “small” side too. You normally don’t want the plate to distract from the food. You can’t go wrong with white plates and bowls. They reflect light into the food well and compliment most foods. They also look great with any patterned fabric. Stock up when you see them on sale! 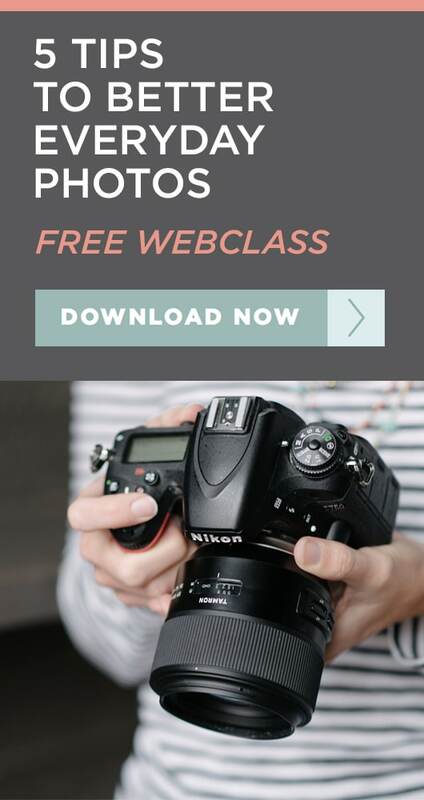 –More subtle patterns or solids work best for backgrounds since they are usually blurred anyways. I have used blankets, sheets, 36 inch mat board in various colors (found at any framing shop), 12×12 scrapbook paper (only works if you are cropping in tight around the food), wood floors and tabletops, and solid colored cabinets or countertops. Keep in mind whether you want a dark or a light background and find something that will work. –Iron your fabrics before you shoot. It will save you editing time later. –Be aware of your reflection showing up in silverware, glasses, or any reflective surface. Try to shoot from a different angle or move your food so you are not in the image. Also be aware of other things that might be reflecting. Here’s a great tip: If you don’t want your silverware to appear shiny, use dulling spray (usually found at craft stores) which makes silverware appear matte, rather than shiny. –Clothespins, clamps, or gaff tape (even stronger than duct tape) work great to hold fabrics in place on walls, backdrop stands, or foam board. These are also great for tightening the wrinkles out. –Clean your surfaces and dinnerware before you begin. Make sure there are no visible fingerprints, smudges, or traces of food. Saves editing time later. Although there is no wrong way to light food, I mainly use indirect, natural light from my kitchen window (I don’t own studio lights, so I won’t go there). Indirect means the sun is not directly shining on the food. That soft window light is what you are after, which gives food a soft, edible look. Set your food on the surface you choose as your background, about a foot or two away from the window. How close you are to the window will determine how lit your food will be. If you need more light, move your food closer to the window. The shadowed side of your food that is opposite the window will need a fill light in order to brighten up those shadows (unless you are going for a more dramatic, shadowed look). I use a piece of white foam board or mat board (found at craft stores or framing shops) to reflect light onto that side. Prop the fill board up with something (a floral frog works well) or have someone hold it for you. A reflector can also be used to add fill light. Wiggle the fill board and/or reflector until it catches the light in the direction you want it to go. 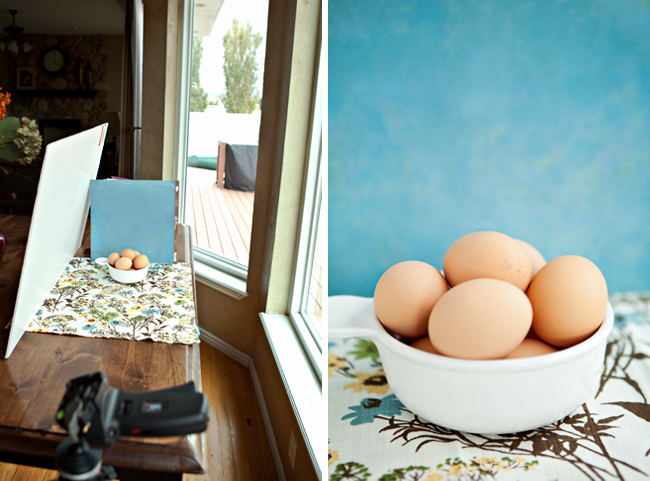 Here’s a pulled back shot of my set up I did the other day while photographing a bowl of eggs. The blue scrapbook paper (being creatively held by a book..ha ha) and the napkin is my background. The white foam board I used as a fill light, which was reflecting light from the window. My main light is coming from the window. –A Westcott Spiderlite continuous light works wonders as a fill light. It is a soft box that stays on all the time, and they give bright daylight-balanced light, so they mix well with natural light. You can adjust the intensity on the light and because they use fluorescent bulbs, they don’t get hot, so you can use them to light food. –Small beauty mirrors, dentist mirrors, or a homemade 1-2 inch mirror glued to a popsicle stick are great for reflecting extra shine to certain areas of your food. –Make your images appear brighter by overexposing 1 or 2 stops in your metering (works best if you shoot in manual mode). But be careful with white food like rice or whipped cream because you may lose detail if your lighting or exposure is too bright. Always keep an eye on your highlights as to avoid hot spots. –When natural light is not available, try to avoid using your in-camera flash. A light coming from the front of your camera will flatten everything and cause you to lose depth, color, and detail. Rather, use your available indoor light and add to it by using your external flash. Point it towards the ceiling or a wall to bounce the light so it will spread nicely across your food. You can experiment with flash filters and gels if you have them as well. Adjust the intensity on your flash depending on how much light you need. Thank you so much for these uh-mazing tips! So simple & yet I never even thought of them! I have a bowl of eggs I’m wanting to photograph right now!! You deserve a round of applause for that post along with specifically, your site on the whole. High quality material. When 1 conceives the situation at hand, i’ve to agree with your finishes. You distinctly show cognition about this topic and i have very much to learn after reading your post.Numerous salutations and i will come back for any further updates. I am so extremely happy reading this posting and I agree with your very last portion of this post. However, I’ve read this particular elsewhere as well. Have you got any other website too? Thanks for the post! I often struggle with what to use in the background of my photos and your styling tips are really helpful. I love that I’m not the only one hanging blankets ect in the background when taking photos – my husband often looks at me like I’ve lost my mind! Thanks again! 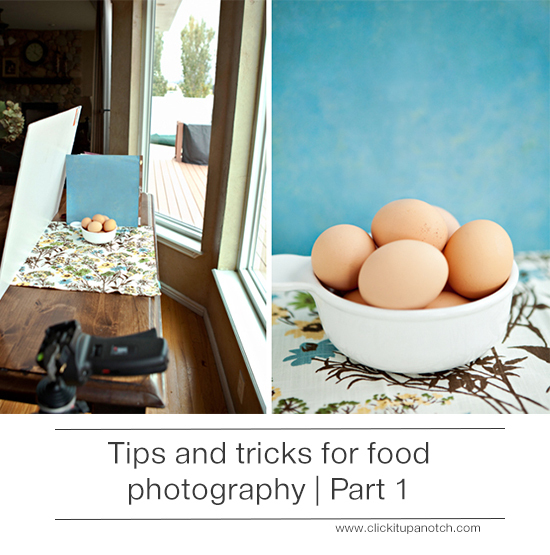 10 Food photography tips & Food Bloggers that are doing it right! The picture of how your shoot is set up totally helps! I’m looking forward to my next shoot! Great tips! Do you have a link to the light you recommended? Also, I don’t know what overexposing 1-2 stops means. Totally clueless here. Would love to see Click it Up a Notch do a tutorial on how to do backgrounds and lightboxes etc. I never know how to set anything up and would love a demo or tutorial how to do studio setups for pets, kids, etc. This is great and so useful for someone like me…a person who blogs about food! I blog about other things as well, but most of it’s food. Thanks so much for sharing! I loved this article! I recently did a food shoot for some scones I baked, and for the first time used a piece of white card to reflect and give the shot some more depth. I was pretty happy with the results! Now I just need to get myself a few more props and start cooking some more dishes!